Greetings Atlas fans! 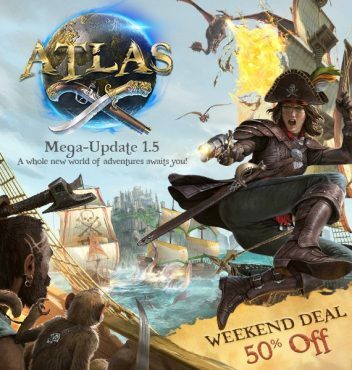 This week a major update came to Atlas bring a lot of new features, new game modes, and much more. Opening a whole new world of exploration, 1.5 bring the new "Deep Ocean Trench". Where you can try your luck against powerful creatures and the new Giant Crab. Also with this major update, three different game modes were added to enjoy with the launch of four fresh official networks. You can find details below about the different rule sets and how each game mode has a unique claiming system. It is now possible to choose the mode which best represents your playstyle within Atlas. The ServerGridEditor and island jsons have been updated to include the new environments. You can grab them here: ServerGridEditor & Fixes. Be sure to check out the full list of changes and servers settings below! Redesign: ATLAS World - 40% more islands/landmass & new world map layout. Redesign: Claim System - Colonies: Freeform building, with more progress-protecting and time-enforced PvP rules creating a cooperative atmosphere, and limits to ensure the game is more oriented towards single players or smaller groups. Previous mode now known as Empires and PvE will be a modified version of colonies. New Item: "Guillotine". Hanging your foes in a noose taking too long? Off with their heads! New Item: "Large Wall". Equipped with parapets and ladder snaps so you can now build a proper defensive perimeter! New Item: "Small Gates". 2-wall high gate structures for wood and stone. New Item: "Player Shops". Players can set up automated shops, listing loot for sale and naming their own gold coin prices. New Item: "Settlement War Declaration". Tied to the War System. Drag over a settlement on the ATLAS map to declare war on them! New Item: More tame tokens for more mythical creatures! Allowing players to have limited-time tames of the Fire Elemental, Rock Elemental and Cyclops. BONUS: Rock Elemental and Cyclops are rideable! New Feature: War System - Declare war on your enemies! New Feature: 1 'Mainline Quest' involving gathering 9 trench stones and defeating the hardmode Kraken! Increased smithy inventory slots to 150. Adjusted the crafting quantities on higher tier blueprints so they don't require as many resources as before. Players can now mount a sail to directly control the sail's open/close amount and rotation settings in a more intuitive way. New group permission which acts as an effective 'company owner'. Only the true company owner can set/unset that specific group rank. Mega-Update 1.5 is now LIVE!